What a convoluted article title… Anyways, I love Breaking Bad I’ve made this clear in other articles. I haven’t got around to writing an article in awhile so instead of writing a separate article for each episode I am going to review the first two, and preview what’s to come WITHOUT SPOILERS. When it comes to shows like Game of Thrones, The Walking Dead, or this one, I don’t read spoilers. I also very rarely watch previews unless I am desperate. I pretty much lock myself away from anything regarding the show until I’ve seen it so I have as clear of a perspective as I can. So I will not spoil anything from Episode 3, an episode in which I have no knowledge about what will happen. I have seen 1 and 2, and will review them sparingly possibly revealing spoilers about those two episodes. So what have we seen? Season 5, to me, is beginning to feel like an epilogue. I am doubtful they will completely take this route. There will be a hard conclusion. There was speculation before the season began about the return of Mike. He is back and now he seems to be part of the time. I feel that in later episodes we will learn more about this guys past, things he has done to make him the way he is. I also think he’s going to become a threat to Walt who after the bitter ending of Episode 2 seems to have completely broke bad. I really like these two episodes, not more than any of the previous finales but Breaking Bad has never been about the high quality of individual episodes. It’s always been about the build up. From the beginning of Season 4 when Gus slit the guys throat with a box cutter that pretty much drew the map to the conflict throughout season 4. Now our conflict is the true anti-hero Walt, and if Mike ends up being a problem for Walt we will have our conflict here. The other conflict will be with the Germans who financed Walt, I believe. I really liked these first two episodes of Season 5, they were gritty and dark like Breaking Bad has always been. But something is about to happen, something big. I simply can’t see Walt succeeding in his business. Gus, as big of a badass as he was, had a weakness. His need for vengeance. Does Walt have a weakness? Easy, his love for his family or one might say his pride in being the best, his adrenaline addiction to the life of crime. Jesse, on the other hand, has always been undecided. He doesn’t really have a team, he’s a wild card. At the same time a lot is going through his head, he could also turn for the worse, or he could realize that Walt is the true enemy. 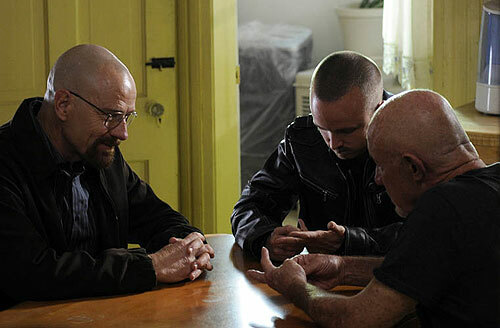 For Episode 3 I think we are going to see Walt, Jesse and Mike start their business successfully…. for now. Meanwhile we still have Hank who is getting closer to the great Heisenberg. Your thoughts?